If the ‘legacy’ of major sporting events can sometimes pose a thorny question, then – in a style which befits the sport of rugby league – Jon Dutton is not shirking the challenge. 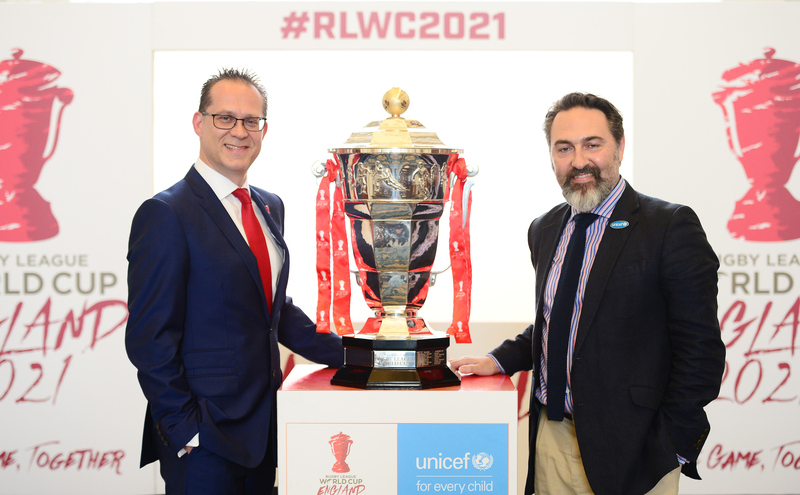 This week the Rugby League World Cup 2021 launched its new £10million facilities fund. This is one strand of the tournament’s ‘InspirationALL’ legacy programme which the tournament’s Chief Executive is determined will leave a lasting impact on communities across the North of England that will be touched by the tournament. With three years to go, communities and clubs can now apply for small and large grants towards anything from kit and equipment, to infrastructure and facilities. Less tangible than bricks and mortar, but just as important, will be the positive social outcomes generated by other strands of the programme which will support dance and choir projects, heritage and culture activities, and tackle issues such as mental health, dementia and loneliness in the towns and cities hosting the tournament. It’s a refreshing outlook on a potentially tough subject, and – with Jon sitting on the UK Sport Major Events advisory panel – perhaps goes some way to explaining the UK’s appetite to host international events at a time when some cities across the world have shied away from hosting, for example, the Olympics. Indeed, UK Sport recently unveiled a list of events it may bid for over the next two decades. Talking to Jon, it’s evident that the lesson has been learned not to shout too much about anything before it has actually been delivered or achieved. In short, don’t over-promise and under-deliver. This pragmatic approach is built on more than 20 years’ experience in the sports industry, including spells at the PGA European Golf Tour, Manchester Football Association, UEFA and the Tour de France Grand Depart in 2014, as well as running his own sports consultancy company. Jon explained: “I started working on the project in 2015 when we went to speak to UK Government about supporting our bid to stage the 2021 World Cup, and we have received an unprecedented level of commitment from Government. “What that has allowed us to do is to start our planning very early. The first two years, 2015 and 2016, were about winning the bid. 2017 was about setting the company up, and that has brought us to where we are in 2018, and this year has been dominated by three things: firstly, our venue selection process, so who will be dynamic and help us to achieve success; secondly, our commercial programme and our partnerships - and we are incredibly proud and delighted that Unicef have partnered with us - and then the third area is around our legacy programme. Perhaps it’s that down-to-earth Northern approach which makes this legacy programme feel less grandiose, and more focused on achieving specific outcomes. As Jon acknowledges, the sport of rugby league has a debt to the people and places from whence it came. Reading the small print around InspirationALL, it talks of creating “positive, accessible and inclusive environments” and addressing barriers to participation, and supporting the “delivery of wider benefits such as community cohesion, civic pride and social development”. Jon said: “It’s really important that we measure impact, that we deliver what we said we would do, and one of our values is to be authentic so when we make a statement, we really need to back that up by delivering. “I would say our legacy programme is different to a traditional legacy programme because it’s not in pursuit singularly of encouraging more people to play the sport, but it’s much broader and we’re trying to engage with a new audience. He added: “I have been involved in working on major events for a long part of my career, and I think historically people have really focused on the economic benefit that a major event can bring. We want to see people visit the different regions, stay overnight and spend their money, but a massive focus for us is on the social benefits. “Yes, the Public Sector is interested in hotel rooms being full in their town or city, but it is the social benefit to someone who is part of our Public Health programme which has real resonance. The acid test, of course, will be whether the legacy programme can demonstrate its impact, especially against the wider backdrop of UK Sport’s wishlist of events. Jon said: “We’re three years out, we’re in a really good place with it and we’ve done a lot of hard work, but we have still got a mountain to climb. I guess whether this is a blueprint is a question for after the tournament and whether we have proven our impact. “I think our approach to legacy is radically different; whether it has the demonstrable impact, only time will tell. “But the focus will be on the local communities in which we land, and have we made a difference and have we inspired people to engage with our tournament. Apply for the facilities grant here.